This was a project we did last month, but I’m just getting around to the pictures and sharing. It was one of the last 90+ degree days we had in September and Bob asked what we were going to do. I said it would be a good day to pressure wash the house, and he agreed. So, I called up Rental World and reserved the pressure washer and drove to pick it up right away. 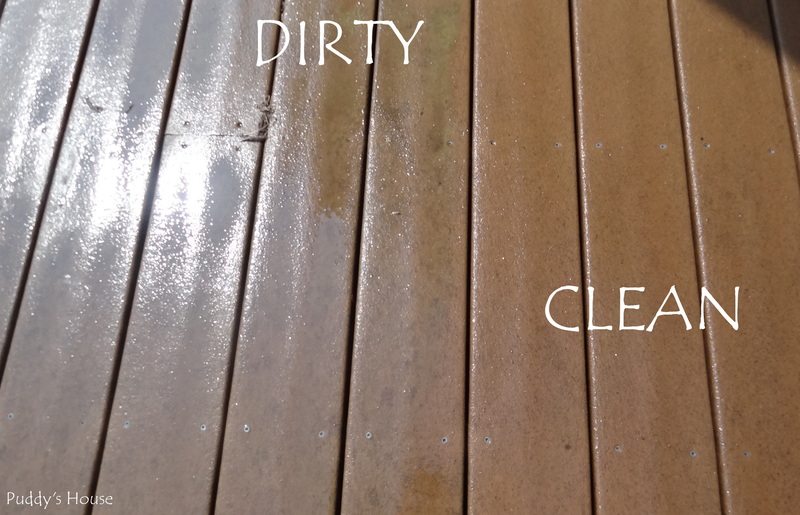 Our house and deck were DIRTY. We had not really cleaned them since we moved in and it was past time to clean them up. I tried to really show the dirt in the pictures, but it is difficult to capture how bad it was, so just imagine it as worse than these pictures show. 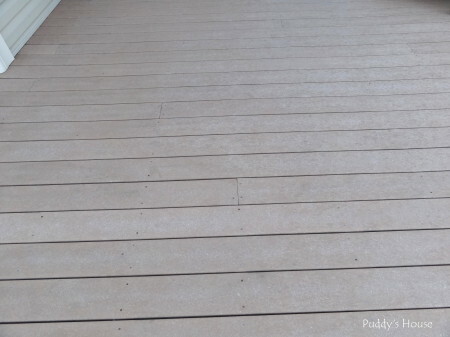 The deck had lots of black spots. 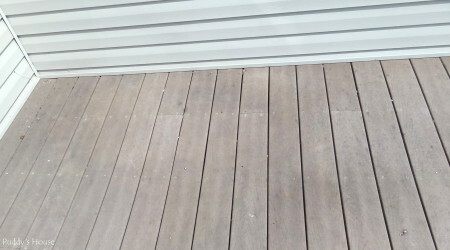 Especially in the corner where we normally keep our deck box. The house wasn’t much better. You could really see the dirt and mold on the spouting. Bob and I took turns with the pressure washer. It is not a difficult job, but it does make your arms tired, especially when you are working above your head. With the deck and siding, it was easy to see what part you did and what you didn’t. Plus, you can just follow the lines to keep track of where you are at. I tried to show the difference in this picture. Right by the Y in dirty, you should be able to see the distinct line from what I had cleaned and what I hadn’t. Bob had to do most of the spouting and soffit above the deck because it was difficult for me to hold the pressure washer that high and steady. Even though our house is one-story, we still used a ladder to get close enough to the spouting to really clean it. 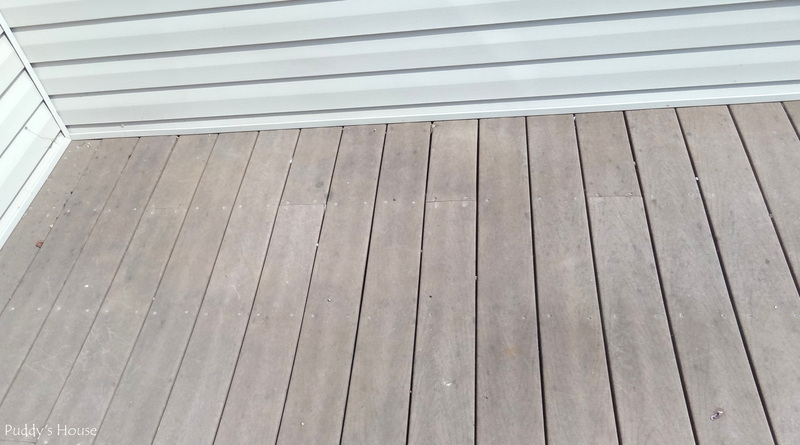 After doing the deck and surrounding siding and spouting, we realized it was a slow go. And, unfortunately we knew the one side of our house that doesn’t get much sun was even dirtier. So, we added an extra step to improve our cleaning. Months ago when we first thought about cleaning our house, we had bought some house wash that you just hook to the regular hose and apply. 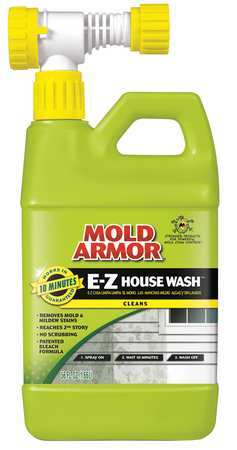 When I went to the garage to get it, I found we had two different kinds – Mold Armor and Olympic House Wash. I ended up using both and didn’t notice a difference. 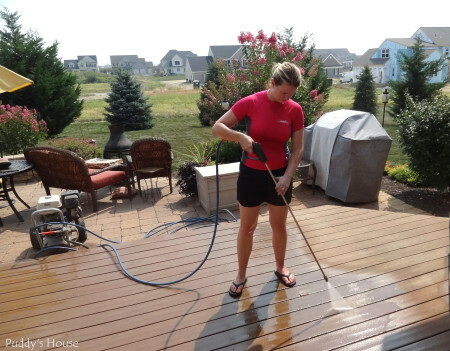 Before I applied the house wash products, I hosed down all the plants along the house, which was a step included in the application directions. Then, I just attached the product to the hose and sprayed. This was the side after I had applied the house wash. You can see the soapy bubbles. You can also see how dirty it was. The products worked very well. It made it much easier to just pressure wash. We didn’t end up needing to use the ladder along the sides because the house wash had loosened the dirt and grime and we were able to move along much more quickly. 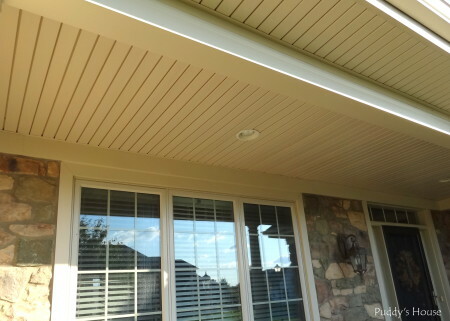 Because it worked so well on the worst side of the house, we used it on the other two sides of the house too. 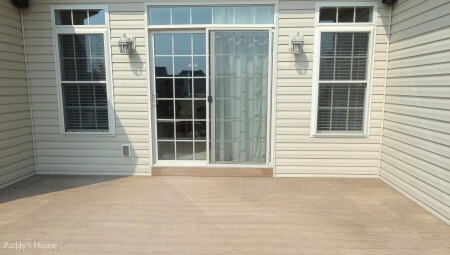 It also was very helpful on the porch…it worked just as well on cobwebs as it did on dirt and grime. 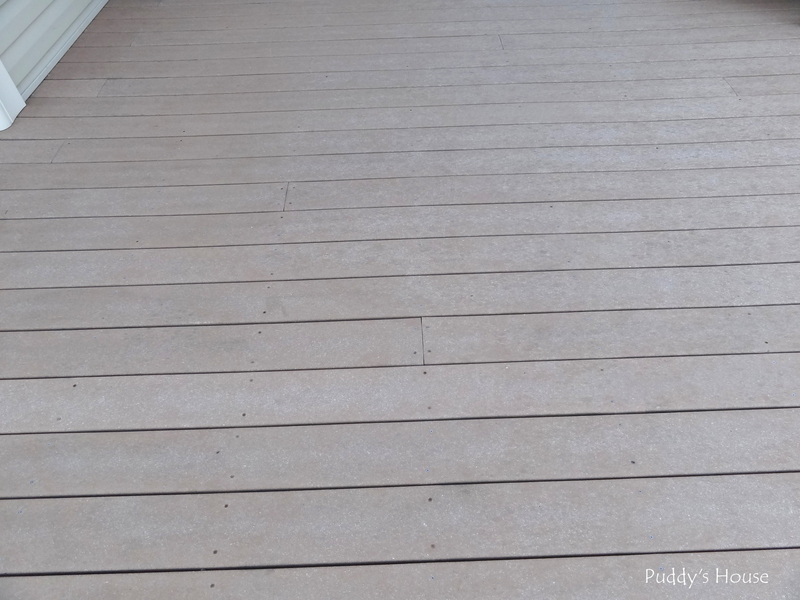 🙂 After about 4.5 hours of work – we took a few breaks in between, our house and deck were all nice and clean. 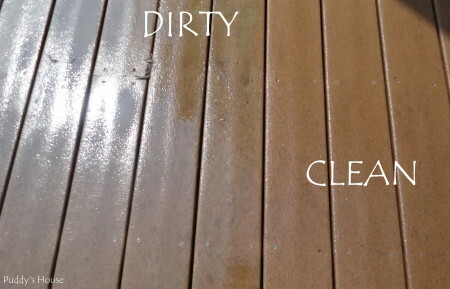 No more black dirty spots on the deck. 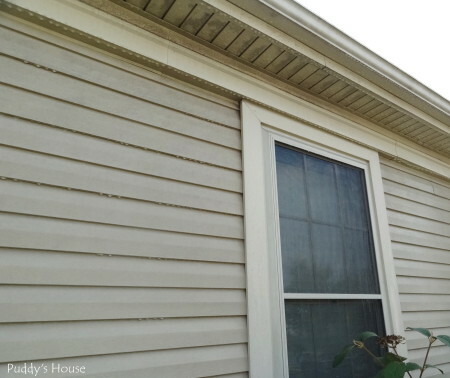 And, no more mold on the siding. I know this is not a very exciting DIY project, but it is definitely a project that I think anyone can DIY. We had put it off at least all summer, thinking we needed to plan it out, but really we just needed about one afternoon and approximately $90 to rent the pressure washer. I’m not sure how much the house wash cost since we bought it so long ago. 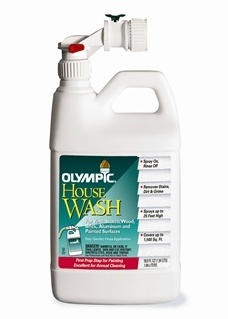 I will say, if your house needs cleaned that it might be worth just trying the house wash, because you can just wash off the product with the hose (there is a water only setting on the house wash bottle that gives it more pressure for rinsing). And, that way you wouldn’t have to do it all at once. 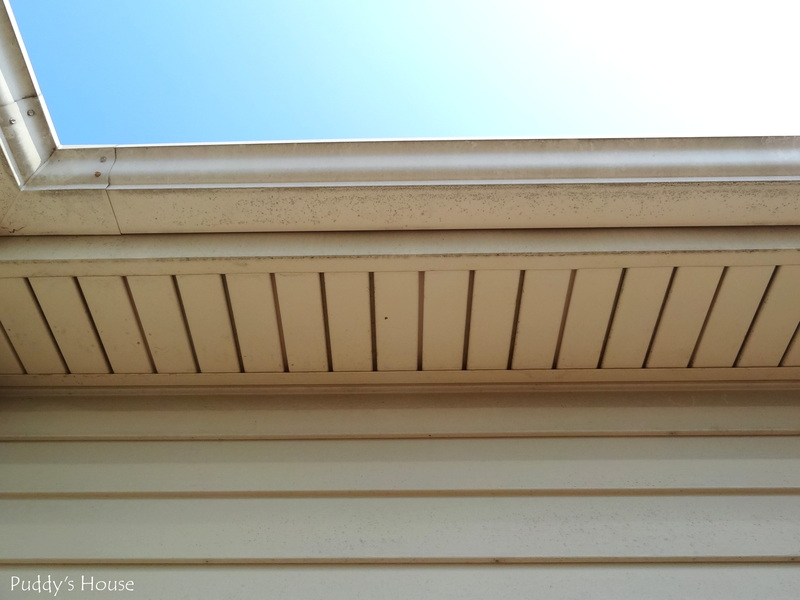 As far as the cobwebs, I know I tried before with the broom and it takes forever and doesn’t work well, but the house wash was a really quick method to clean the porch roof. 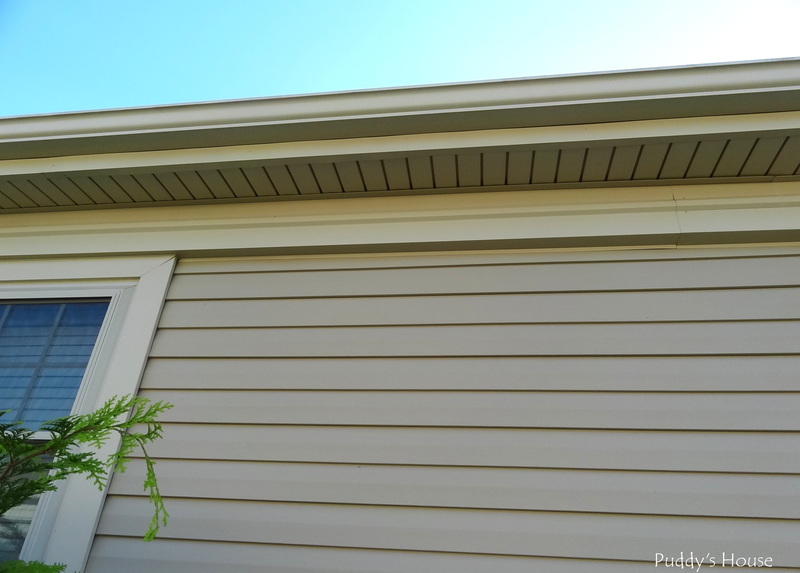 Anyone else DIY their house exterior cleaning? Any other methods to try? This is so basic but lovely. 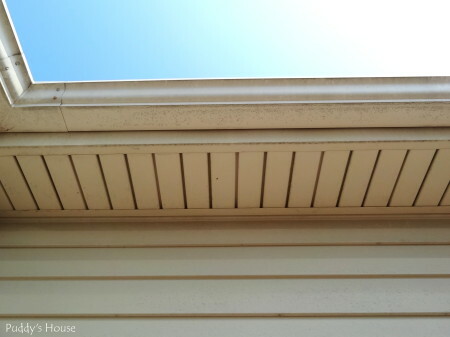 Taking care of mold on the house really makes a difference. 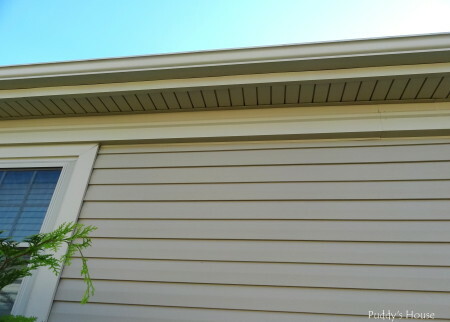 I’d love to post about our roof cleaning, but my videos are so bad. But it’s the same, lovely, refreshing result. Thanks Darla! I think that’s why it took me so long to share, because the pictures weren’t exciting, but every time I look at our clean house I feel good about it.